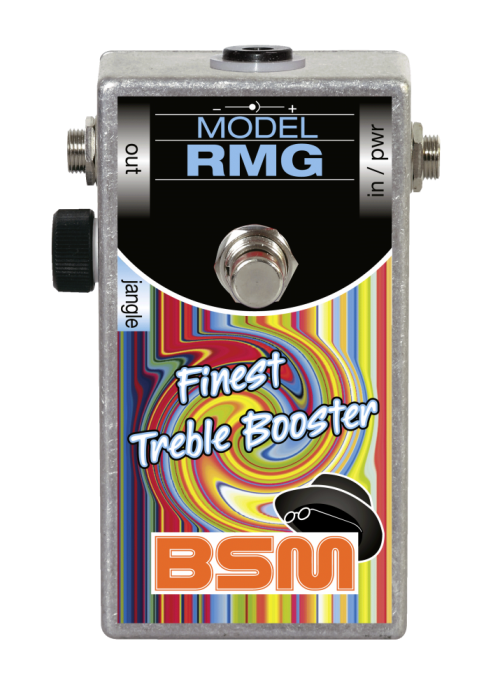 The BSM RMG model is based on the british Vox Treble & Bass booster made in the late 60's, used by many british bands at this time. Here is a custom version of this Vox unit as a homage to the famous BYRDS guitarist Roger McGuinn and his signature "jingle jangle" sound. The RMG´s customized tone network, makes it the perfect treble booster for all clean sounds. The RMG model includes a tone control, that allows an extraordinary amount of versatility. It can add a lot of twang and spank to any guitar sound. By pronouncing the percussive attack in a very musical way, any guitar will sound more "in the face" that way. With the tone pot set to maximum (5:00 o'clock), the unit will produce a very glassy tone - the classic "jingle jangle" sound of Roger McGuinn during his mid 60s time with the BYRDS, think of "Mr. Tambourine Man" and you are on the right track. When a middle setting is dialed in (12:00 o'clock), the result is a punchy tone, with mild highs and a tight and powerful bass bottom, a perfect sound for any Country/Nashville and Rockabilly style. If it´s set to minimum (7:00 o'clock), you will get a bluesy bottom with enough mids and a little bit of shimmering highs for all you jazz and swing cats out there. The RMG fits perfectly all kinds of music, where a good clean tone is essential and you can use it for all styles of Country, Rockabilly, Jazz, Swing, Bebop and many more. The RMG can also make any standard Stratocaster sound like a Telecaster guitar! To take full advantage of the RMG's possibilities, you should use it together with a compressor. You can run the RMG into the compressor or vice versa, feel free to experiment and find out what you like best. In general the RMG works better in combination with analog compressors than with digital devices, same with chorus and delay. The RMG sounds great in front of any tube or transistor amp, so it´s one of the very rare boosters, that also work great with transistor amps, often preferred by guitarists playing clean all the time. You can even use your RMG with your acoustic guitar. Almost all british rock guitarists using singlecoil pickup guitars, used some type of germanium booster from the late 60's to the mid 70's. At the end of the seventies, these boosters were replaced with a new circuit from Japan, the socalled "Tube Screamer" and other similar overdrive circuits. These were based on the old boosters and therefore had a very similar frequency response. The treble boosters on the other hands side, sadly fell into oblivion, despite their unique and inimitable sound. Roger McGuinn used a Vox Treble Booster and a compressor in front of Fender amps and played Rickenbacker 12-string guitars with "toaster" pickups. The RMG Booster is 100% true bypass and inserted between the guitar and the amplifier, not into the FX loop. The magical tone is achieved by the interaction between guitar pickup, booster and amplifier. The unit is powered by a single 9 volt battery with a current consumption of aprox. 50 uA. You can also power the unit, using the external "Boss style" (2.1mm - tip negative) DC jack, the internal battery will shut off automatically then. The average output level is 0dBm, the maximum output voltage when the strings are struck really hard is 2V max. You can also power the unit, using the external "Boss style" (2.1mm - tip negative) DC jack, the internal battery will shut off automatically then. For even more clean headroom, you can also power the RMG with 18 volts. A bright LED will light up, when the booster is engaged. Note: The negative pole of the battery is ground! If you have any questions concerning our products, especially the BSM RMG Clean Boost, our tech-head and mastermind Mr. Bernd C. Meiser would be happy to talk to you. So don't hestitate any longer and send him an email to info@treblebooster.net or use the contact form to contact him.